Rising tides in the Leete's Island Salt Marsh: mowing hay forty years ago, under salt water now. Being a farmer has never been easy. But it gets even harder when fields flood with salt water. Stretching east of New Haven, the Connecticut shoreline follows the Long Island Sound in a bucolic tract of almost continuous salt marsh. Land and sea wend their way among inlets and islands, necks and coves that stretch all the way to the Atlantic Ocean. For centuries this meeting of earth and water has been fertile farmland for the local inhabitants, yielding harvests from shellfish to salt hay. But like most ecosystems, it requires balance. Today, the farms and marsh are threatened, in danger of drowning under the siege of uncontrolled tides and inept government. European settlers farming in the 17th century built dykes, jetties and berms to control the flow of water during high tides and storms. These systems protected houses and farms from hurricanes and high perigee tides (when the moon is closest to the earth) that periodically inundate the land. Floodgates and flapper valves let the waters in and out as needed. Salt hay was mowed when the fields were dry. Later, the greater marshland came under the control of governmental agencies like the Department of Energy and Environmental Protection (DEEP) who, together with the locals, managed floodwaters. Their involvement also included environmental controls such as releasing killifish into the marshes, which eat mosquito larvae. Of the many indigenous gifts of salt marshes, salt hay is one of the finest. Due to its saline coating, it is free of weed seed, unlike other hays. This makes it a highly valued crop; it has been shipped from the shoreline as far as Canada. Along with being a good insulator for ice, it is prized for mulching, especially for delicate crops like strawberries. Up until twenty years ago the Leete family, whose first Branford farm dates to 1639, produced 1100 bales of salt hay a season, which sells for $12 a bale. But like much of the natural environment, salt hay is finicky and only thrives under certain conditions. It likes a tidal habitat where the water recedes every twelve hours, letting the grasses dry out. These days the Leete salt marsh is flooded all the time, even at low tide. The constant high water is killing the plant, rotting the roots, and on a warm day it stinks of decaying vegetable matter. What causes rising waters is disputed- the melting of the polar ice caps, ocean surges due to climate change, or the shift in the Gulf Stream towards the eastern seaboard. But what's not in question is that the waters are rising: ask anyone who has lived a life close to the Connecticut shoreline and they will tell you tides are higher than before. Bill Leete, born in 1940, showed me a stone pier that was always at least a foot out of the water when he was a kid. Now the waves break over it at high tide. Out on the Thimble Islands that sit offshore, many docks have required raising to keep them out of the water. Farming with these slowly rising waters was manageable with the old dykes- their simple systems were effective. That is, while they were maintained. But in an unfortunate dovetailed timing, the higher waters have arrived at the same time that governmental regulators have abandoned tide controls. Maintenance has eroded, taking the salt marsh with it. Ironically, the very agencies that are avowedly dedicated to environmental protection, like the DEEP and the land trusts, have contributed to destabilizing the salt marsh. Dykes have not been repaired, and in some cases, floodgates and berms have been deliberately removed, causing an abrupt change to the water levels at such a fast rate, the marsh is not able to adjust. With the incoming tide, water rushes through the unchecked dykes in a torrent. Pressure from the sea forces the water into the marshes, but there is no corresponding pressure to carry it out. The excessively high waters have affected not just the salt marsh, but the entire surrounding community- the tidal fields, the farms, the houses, the roads. 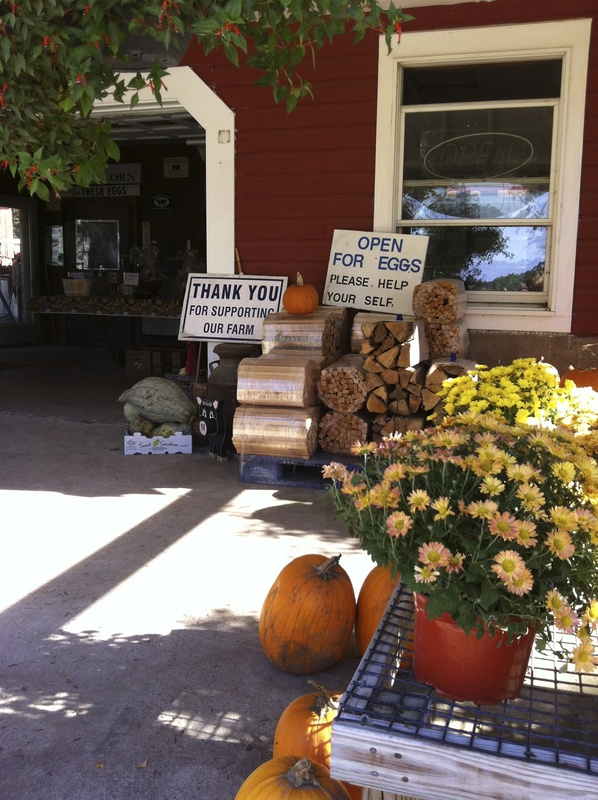 Down Route 146 from the Leete's, Jay Medlyn grows organic vegetables on his small family farm begun in 1880. People drive for miles to buy his tasty tomatoes. Since the berm that restrained the tides was removed, Medlyn has lost a foot of topsoil and acres of pumpkin and corn to salt water. After the erosion from storms Sandy and Irene, the higher salt water has seeped into his reservoir, leaving him no fresh water for crops or livestock. Trees around the marshes are dying, unable to cope with the salt water. People who live near the marsh have lost their septic drainage and their fresh water wells. Sections of Route 146, a state road that carries local shoreline traffic, are flooded at high tide. Branford First Selectman Unk DaRoss points out that the state road was not built at the high water mark. Local residents, dependent on a stable environment to protect their land and livelihood, repeatedly appeal to the state agencies for help in maintaining the controls that worked for hundreds of years. The agencies send groups of bureaucrats to look at the problem. Scuba divers investigate. Engineers evaluate. Notes are taken. At one point they came up with a plan and asked the farmers for approval, but by the time all the forms were filled out and licenses granted, the state money had been spent elsewhere. Whatever the multiple causes, the challenge of maintaining balance under changing conditions has not been met. Governmental agencies with a mandate to preserve and promote marsh restoration have been negligent in ignoring the repercussions of uncontrolled waters. Before more homes are lost and more farming curtailed, surely they should consult with the people who live and work on this fragile land; they are part of the environment, too. 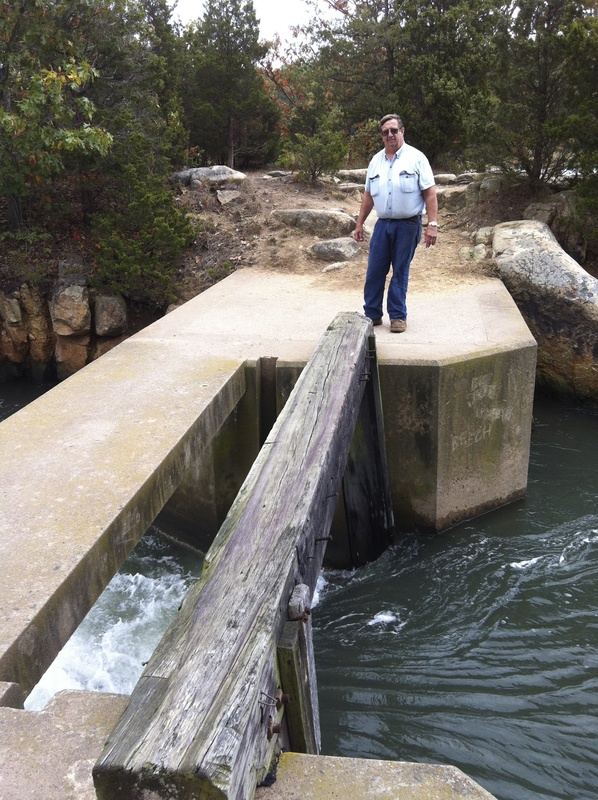 Jay Medlyn observing incoming tidal waters at broken Jervis Creek dam. Route 146 at high tide.